At the height of the Golden Week holidays, the weather in the Kansai area turned perfect — t-shirt warm with cloudless blue skies. It was like a California summer day, and if you live in Japan you know how rare it is to actually have a day like that. It was a perfect day to take the train to Kyoto, and since everyone else in Japan had the day off too, the train was packed. Nevertheless, even in the middle of an endless flow of people, Kyoto on a beautiful day is a magnificent place to be. Jess and I walked up to Yasaka Shrine first, where we ate some takoyaki and grilled bamboo shoots for lunch, and then we headed out through Eastern Gion toward the HIgashiyama area. Yasaka Pagoda (no relation to Yasaka Shrine), is all that remains of a larger Buddhist temple that once stood there. 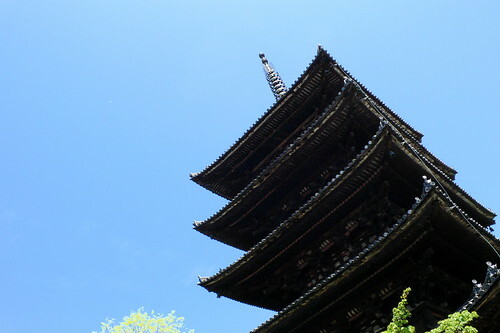 The pagoda, somewhat of a Kyoto landmark, was built in 1436 and its five stories emerge startlingly from within a landscape of low wooden buildings. Inside the pagoda there are four golden Buddhas, and you can climb a very steep ladder-style stair up the second level where you get a good view of the enormous post that supports the five-story building. 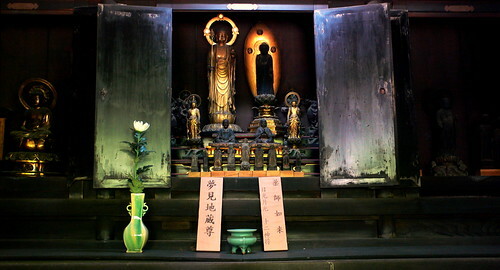 This is a picture of one of the Buddhas inside Yasaka Pagoda. 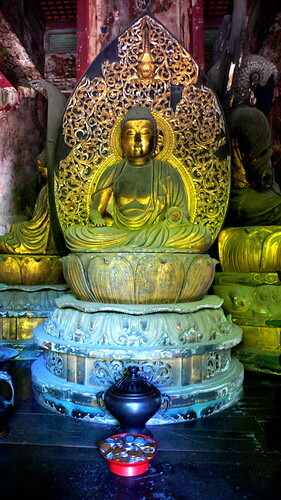 Though the Buddhas are mostly gold, there are various deep hues that hover around their skins — perhaps greens, and purples, and reds. This is a small Buddhist shrine located just to the side of the pagoda proper.